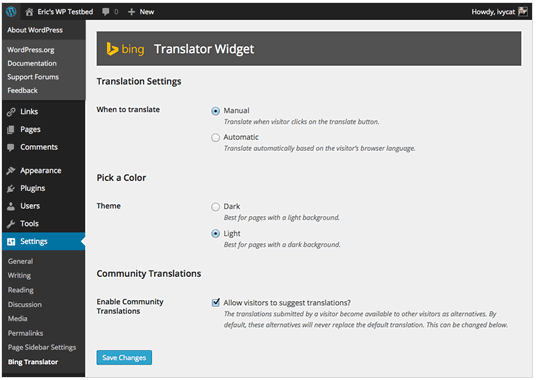 Recently, IvyCat teamed up with Microsoft Open Technologies to develop the new Bing Translator plugin for WordPress and we were thrilled to be on-board. The Bing Translator Plugin is deceptively simple. By adding a widget to your blog, your readers are able to instantly translate your site into over 40 different languages, including Klingon. Having the power to reach a truly global, even inter-galactic, audience with one single plugin is no small feat. Bing’s Translator plugin is also adaptable in that it allows your readers to correct and suggest more accurate translations in their native tongue. The plugin allows you to select a color to best fit your site. You can also configure it to automatically translate your site based on the language settings of your visitor’s browser. We loved working with the Microsoft Open Tech team and are very proud of the Bing Translator plugin and how it enables folks to connect worldwide. Brady Vercher at Blazer Six – Lead developer, code wrangler, all-around great guy. Matthew Sparrow – plugin testing and review.